Gerald Grant, MD currently serves at the chief of pediatric neurosurgery at Stanford Children’s Health and associate professor of neurosurgery at the Stanford University School of Medicine.. He is a former lieutenant colonel in the U.S. Air force where he served his country on active duty from 2002 till 2006. In 2005 he was one of 18 U.S. Air Force and Army surgeons in a tent hospital at Balad Air base in Iraq. 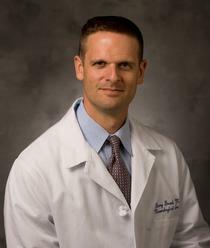 Before joining the staff at Stanford, Dr Grant was an associate professor of neurosurgery and associate professor of pediatrics at Duke Medical Center in Durham, North Carolina where he was a part of the Center for Human Genetics team investigating the hereditary basis of Chiari type I malformation with or without syringomyelia (CM1/S) . He obtained his MD at Stanford University School of Medicine (California) in 1994 and continued his training at the University of Washington Medical School from 1994 – 2001. He also performed a fellowship in Pediatric Neurosurgery at Children’s Hospital and Regional Medical Center in Washington, 2001-2002. Dr Grant joined the ASAP Medical Advisory Board in 2012. Dr Rekate was recruited to Arizona in 1984 as the first pediatric neurosurgeon in Arizona. Dr. Rekate graduated from Duke University in 1966 and received his MD degree at the Medical College of Virginia in 1970. Dr. Rekate was trained in neurosurgery and pediatric neurosurgery at the University Hospitals of Cleveland, Case Western Reserve University under Dr. Frank E. Nulsen who is recognized as one of the innovators of valve regulated shunts in hydrocephalus. After finishing his residency he became chief of pediatric neurosurgery at Case and Rainbow, Babies and Children’s Hospital in Cleveland. While there he worked with the engineering faculty at Case Institute to study problems of intracranial pressure and spinal fluid flow using engineering techniques and mathematical modeling. He became Adjunct Professor of Systems and Design Engineering at Case. His research regarding spinal fluid flow has been funded by both the National Institutes of Health and the National Aeronautics and Space Administration. He was the winner of the prestigious Pudenz award for excellence in CSF Physiology in 1992. He has over 200 publications on a variety of subjects but 75% of them have related to cerebrospinal fluid difficulties including Chiari malformations, syringomyelia, hydrocephalus and structural problems at the craniovertebral junction. Dr. Rekate has held many local, national and international offices including the Chairmanship of the Joint Section on Pediatric Neurological Surgery of the American Association of Neurological Surgery and the Congress of Neurological Surgery, and president of both the American Society of Pediatric Neurological Surgeons and the International Society of Pediatric Neurosurgery. He has served as editor for a number of prestigious journals including being the chairman of the editorial board of the Journal of Neurosurgery Pediatrics. Paolo Bolognese, MD, graduated from the Medical School of the University of Turin where he completed his neurosurgical training in 1990. He became the leading worldwide expert in the field of laser Doppler flowmetry applied to neurosurgery and the top European figure in the field of neurosurgical intraoperative ultrasound. Upon the death of his former mentor, Professor Victor Fasano in 1992 he accepted the invitation of Dr Thomas Milhorat to transfer his laser Doppler research to the United States where he retrained under Dr Milhorat at SUNY Health Science Center at Brooklyn. In addition to his US neurosurgical training, Dr Bolognese became the first trainee of the Fellowship in the Surgical Management of Chiari I Malformation and Related Disorders under Dr Milhorat. In August 2001, Dr Bolognese joined Dr Milhorat at the Departments of Neurosurgery at North Shore University Hospital and Long Island Jewish Medical Center and as Associate Director of the Chiari Institute.